The rules for double solitaire are similar to those of the Klondike version of solitaire. It can be played competitively or just for fun. Like solitaire, you can easily lose if the game becomes blocked, but you can have a chance to win and still lose if your opponent manages to win before you do. 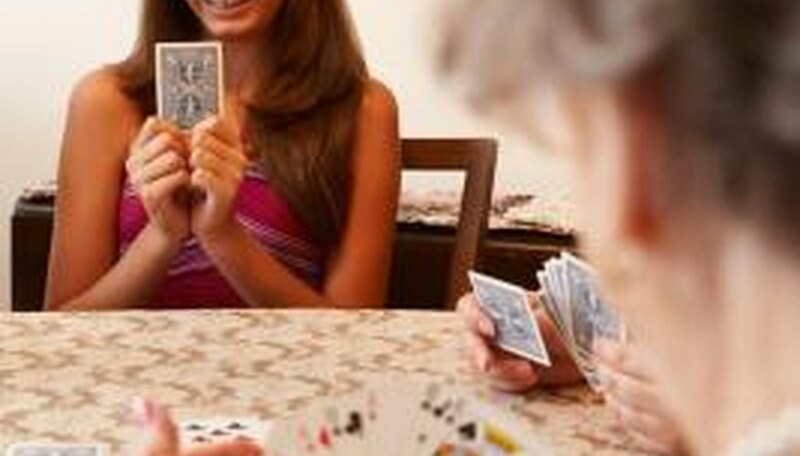 To play double solitaire, you need 2 standard decks of 52 playing cards. It is best that the 2 decks are different so that they cannot be confused or mixed up. To begin the game, each player deals 28 cards into 7 piles. The pile to the furthest left has just 1 card (face up), the second one in has 2 cards (with the top 1 only face up), and so on, with the final pile on the right having 7 cards, again with the top 1 the only one face up. There should also be a foundation pile for each player. Each player should have 24 face-down cards left with which to start the game. The first turn goes to the player who has the lowest card visible on his left-hand pile. If there is a tie, then go to the two-level pile, and on (if necessary). During your turn, you may only use your own piles to move your cards. Play using the same rules as Klondike. When you cannot make any more moves with your cards, or if you wish to stop playing, then you end your turn and your opponent begins his. There are 2 ways to win the game. If the game becomes blocked, the winner is the player who has gotten rid of the most cards. Otherwise, a win can occur when a player gets all 52 cards played. You may choose to play almost any solitaire game as double solitaire. Simply agree with your partner ahead of time as to what constitutes winning, whether it is point-based on time-based. You can play online versions of double solitaire, playing either the computer or another player at a distant location. Some websites offer this for free, but others are subscription-based and you will need to pay to play.